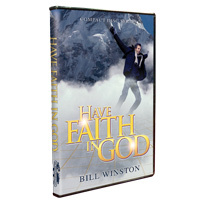 In his new series “Have Faith in God” Dr. Bill Winston sets the record straight on why it is vital that every believer have “real” faith in God. In this series you will discover what misplaced faith is and why it is so dangerous, the role love plays in your faith walk, why real faith is not timid and so much more! There are some things that God can’t do for you until you truly believe. Begin living a life full of the miraculous and the supernatural when you wholeheartedly begin to have faith in God!